The study examined the perception of project participants and extension officers regarding marketing of agricultural produce in agricultural projects in the North West Province. The objective of the study was primarily to compare the perceptions of project participants and extension officers. When establishing a project, market and its stability with regards to the produce of the project has to be established on whether the project will maximise profit, maintain market share, or consolidate market position. The major findings of the study according to both project participants and extension officer respondents revealed that: (a)The market was reasonable according to 54% of project participants and 53% of extension officer respondents; (b) The market remained unchanged according to 48% of both respondent categories; (c) Produce slightly met the market requirements in terms of quality; (d) Produce did not meet market requirements in terms of contract; (e) The market price was average; (f) The market assessment in terms of the quantity it can absorb was average; (g) Project participants used hired transport according to 35% of both respondent categories; and (h) 33% of both respondent categories indicated that produce were marketed locally within the community. Agricultural marketing covers the services involved in moving an agricultural product from the farm to the consumer. Numerous interconnected activities are involved in doing this, such as planning production, growing and harvesting, grading, packing, transport, storage, agro- and food-processing, distribution, advertising, and sale. It is always essential to make an assessment of the market in terms of the quantity it can absorb, so that one knows what will happen if one increases the rate of production and how it will affect market share, through assessing competitors in the market (Burke, 2003). Whilst quality is essential in marketing of produce, quantity to be supplied periodically is vital in keeping the contract between the producer and buyer in harmony. Once a project is established, regular assessment of the market and supply and demand curve needs to be monitored so that the demand for the product now and forecast demand is known. Chipita, Christoplos & Katz (2008) pointed out that the agricultural market environment is changing with unprecedented speed and in a very diverse way, globally and locally. These dynamics affect rural people even in the most isolated areas. Extension advisory services in the most isolated areas can play an important role of increasing access to market by assisting needy farmers. Financial awareness of farmers is always essential to make sure that they make a proper assessment of all resources that they manage. Furthermore, they must be aware of financial loss (Lombard, Hadebe, Louw & Botha, 1995). They must also be able to budget independently and be willing to interpret financial records so that they can make informed decisions. Market seems to be an ingredient that explains the difference between the many failed projects and few successful ones. Farmers frequently consider marketing as being their major problem. However, while they are able to identify such problems as poor prices, lack of transport and high post-harvest losses, they are often poorly equipped to identify potential solutions. Successful marketing requires learning new skills, new techniques and new ways of obtaining information. This study focuses on the perception of project participants and extension officers concerning marketing of agricultural produce. The study compares the perceptions of the two categories of respondents in relation to all variables identified for this study. In general, the objective of the study was to compare the perceptions of project participants with that of extension officers regarding the market. Assess the market in terms of: (i) performance status; (ii) availability; (iii) transport costs; and (iv) market place as perceived by project participants and extension officers. Determine the degree to which the produce meets market requirement in terms of: (i) quality; (ii) quantity it can absorb; (iii) contract; and (iv) price as perceived by project participants and extension officers. Provincial statistical figures were extracted from Provincial and Districts reports. A list of projects, their addresses and location were obtained from Local Agricultural Development Centres (LADC). Reconnaissance survey was done in all districts to check the status of projects before the actual commencement of an in-depth survey. Furthermore, field staff were consulted on various aspects of the survey. Information on project location, size, number of participants and gender was obtained from LADC, District Office and Head Office (Mmabatho). Information on the potential of the areas, soil types, livestock types, etc. was obtained from the Scientific Technical Support Services (STSS) in Potchefstroom. The questionnaire was designed according to the problem conceptualisation framework method as designed by Düvel (1995). A combination of structured (closed questions) and unstructured (open-ended questions) were used. Stratified random sampling was used. The survey was conducted on 25% of the total number of projects submitted by the districts. The 25% covered diverse projects established from different locations, groups and individuals, communal setup and private land, as well as dormant and fully fledged functional projects. In an effort to limit the "I don't know", "I'm not sure", and "That's too private", the importance of the respondent's information was emphasised during the discussions. The flow of discussion was structured in such a way that the interview becomes interesting. Personal or sensitive questions regarding income for example were asked towards the end of the interview. Consideration must be made by project participants/farmers on maintaining market share or consolidating market positions and utilisation of the work force when selecting a project (Burke, 2003:2-4, 48-59). With any project that earmarks funding from the Department of Agriculture and Rural Development in the Province a market has to be established /identified before approval of such funds. The perception of the two respondent categories on market availability was assessed using a 4-point Likert scale with response options for no market, a reasonable market, a good market, and a very good market. The results of the Chi-Square test (x2= 4.512; p = 0.213) indicates that there is no statistically significant association between the two types of respondent categories at the 5% significant level with regards to market availability. According to project participants (54%) and extension officers (53%), markets are reasonable while 20% of project participants and 10% of extension officers indicated that there is no market. Although a reasonably higher percentage indicated a reasonable market, efforts should be made by extension officers to assist farmers to access a good market for their produce. When establishing a project, market research normally needs to be conducted in order to check its stability with regards to the produce of the project. In this instance, the market was assessed in terms of its performance during the duration of the project. Assessment of the perception of the two respondent categories was based on whether the market has improved, decreased or remained unchanged. According to Table 1, the majority (48%) of both respondent categories indicated that the market remained unchanged, while 19% of project participants and 9% of extension officers indicated that the market decreased. A total of 37% of both respondent categories indicated market improvement which is a positive sign that needs to be maintained and further improved upon. The Pearson Chi-Square test indicated that there is no statically significant difference (x2= 3.798; p = 0.151) at the 5% significant level between the two respondent categories with regards to the market status. According to Regenesys School of Public Management (2002), planning for quality requirement for projects is essential to avoid project failure. 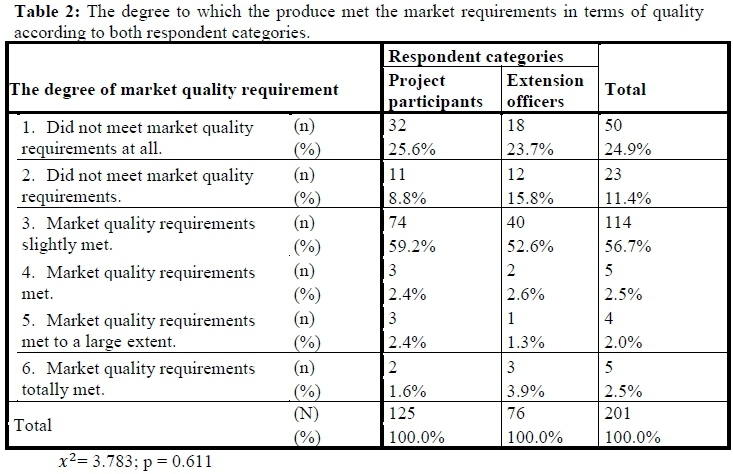 As indicated in Table 2, the highest percentage of project participants (59%) and extension officers (53%) indicated that produce only slightly met the market quality requirements in terms of quality. The second largest percentage of both respondent categories (25%) indicated that produce did not meet the market quality requirements. Only a very small percentage of both respondent categories (3%) indicated that produce met the market quality requirements. The Chi-Square test results (x2= 3.783; p = 0.611) indicates that there is no statistically significant difference for all type of respondents at the 5% significant level with regards to the quality of the produce in terms of meeting market requirements at various projects in the province. If the quality of the produce does not meet the requirements set by the market, it could have disastrous effects on the success of the project. This finding indicates a serious problem that needs urgent attention because if the quality of the produce does not meet the market requirements, the farmers will lose the market. Whilst quality is essential in marketing the produce, the quantity that has to be supplied periodically is essential to keep the contract between the producer and buyer in harmony. It is therefore essential that producers must always ask themselves the following two questions before entering into any contract with institutions or organisations as listed by Burke (2003): (a) Will the project maximise profit? (b) Will the profit maintain market share, increase market share or consolidate market position? These questions will reassure the producer about his /her position in terms of entering into any agreement with any institution or organisation. 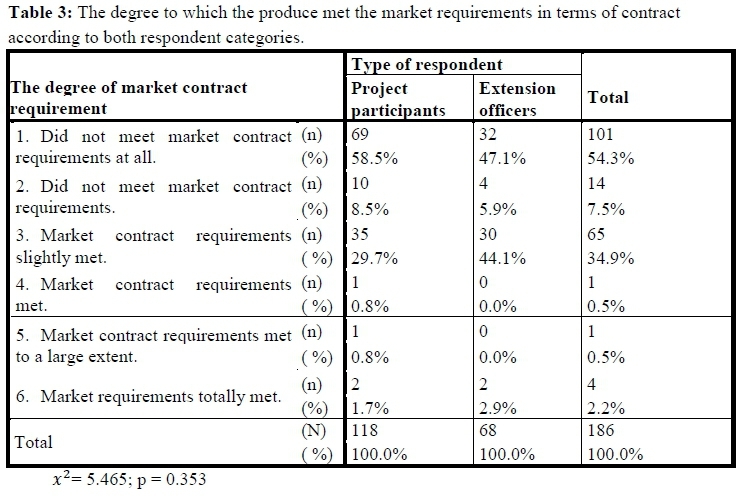 According to Table 3, the highest percentage of project participants (59%) and extension officers (47%) indicated that produce did not meet the market requirements in terms of the contract. The second largest percentage of both respondent categories (35%) indicated that the produce only slightly met the market contract requirements. Only a very small percentage of both respondent categories (3%) indicated that produce met the market contract requirements also to a large extent and even totally. The Chi-Square test results (x2= 5.465; p = 0.353) indicates that there is no statistically significant difference at the 5% significant level for both respondent categories. This finding once again clearly indicated a serious problem that needs to be attended to by extension officers. Financial awareness to farmers is essential to make sure that they make a proper assessment of all resources that they manage. Furthermore, farmers must be aware of financial loss (Lombard et. al., 1995:65-77). They must also be able to budget independently and be willing to interpret financial records so that they can make informed decisions. The perception of both respondent categories regarding the market price was assessed using a scale between very bad to very good. According to the majority of project participants (40%) and extension officers (36%), the market price was average and only 3% of project participants and 1% of extension officers reported that the market was very good. A total of 29% of both respondent categories indicated that the price was good. Furthermore, 20% of project participants and 21% of extension officers reported that the market price was very bad. The Pearson Chi-Square (x2=3.823; p = 0.442) again indicated that there is no statistically significant difference at the 5% significant level between the two respondent categories with regards to the market price. The majority (70%) of both respondent categories indicated that the price received was average and even above average. This finding suggests that extension officers should assist farmers to a level where they get a good price for their produce. It is necessary for extension services to ascertain or make an assessment of the market in terms of the quantity of produce it can absorb as a form of assistance to the farmer, so that one knows what will happen if the farmer increases the rate of production. According to Burke (2003:2-4, 48-59), this will also determine how it will affect market share, through assessing competitors in the market. The majority of project participants (39%) and extension officers (36%) indicated that market assessment in terms of the quantity it can absorb is average. 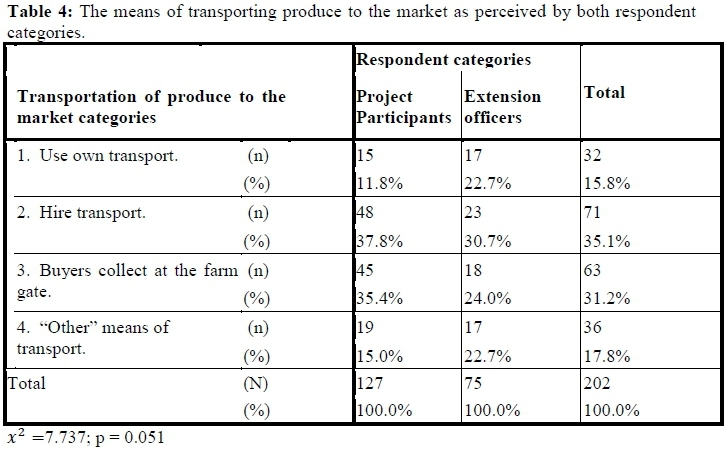 Only 8% of project participants and 7% of extension officers indicated a very good absorption of produce by the market. A total of only 23% of both respondent categories indicated a bad to very bad perception on the quantity the market can absorb. The Pearson Chi-Square (x2= 0.827; p = 0.931) indicated that there is no statistically significant difference between the two respondent categories with regards to the market status. A small percentage (8% of project participants and 7% of extension officers) of good market absorption means that farmers must be careful when they plan quantities of produce for their market. Extension officers should assess the market situation and inform the farmer before a farmer can start to use his financial resources. When establishing a project, the effect of location on the project must be considered (Burke, 2003), and the logistic requirements during the project and subsequent operation be met through existing roads and ports. 'How do participants or farmers get their produce to the market', was one of the questions raised during the survey. The highest total percentage according to both respondent categories (Table 4) was on hired transport (35%), followed by buyers at the gate (31%), other means of transport (18%), and use of own transport (16%). The Chi-Square test reveals an indication of an association (x2=7.737; p = 0.051) whereby project participation (38%) makes use of hired transport and 31% of extension officers indicated the use of hired transport as important. If the majority of farmers use hired transport, it means the income of the majority will be affected as illustrated in Table 5. Extension services should intervene by suggesting short term measures to encouraging them to sell at a particular time for them to share transport costs. Farmers must be advised to make contributions towards purchasing their own transport to cater for all their immediate needs. The mean transport cost according to project participants (25.37%) and extension officers (22.28%) are presented in Table 5. The T-test results (t= 0.001; p = 0.334) indicates no statistically significant difference at the 5% significant level across the two respondent categories. The fact is that the cost of transport was between 22 and 25% of the gross income of the produce sold at the market. Once the project is established, regular assessment of the market supply and demand curve must be monitored so that the demand for the product now and forecast demand is known (Burke, 2003). Areas identified by the study where produce can be sold were: (a) farm gate; (b) local community market; (c) auction sales; (d) open market; (e) pre-arranged market; (f) pension point; and (g) in town. The highest total percentage according to both respondent categories was at the local community market (33%), followed by buyers at auction sales (25%) and other means of marketing produce (20%). The Chi -Square result (푥2 =13.128; p = 0.062) reveals that there is no statistically significant difference at the 5% significant level between the report of participants and extension officers about where produce is sold. The importance of this finding is that before production, market must be known in terms of the distance, area, price, and arrangements such as contracts. Extension officers should advise farmers of such important variables that can ultimately affect their income. The study compares the perception of the two groupings in relation to the most decisive variables in agricultural project marketing. The variables that were used to compare the perceptions of the two groupings were: (a) market availability, (b) performance status, (c) transport, and (d) meeting market requirement in terms of quality, quantity, contract, and price. According to the National Development Plan for South Africa (National Planning Commission, 2012), there is an urgent need to invest substantially in providing innovative market linkages for small-scale farmers in communal and land reform areas. Specific attention should be given to linking farmers to "food away from home" markets, namely take-away outlets, school feeding schemes, and food services in hospitals. Project planners need to investigate the possibilities for opening access to the above mentioned "new" markets and link them with the project. No farming enterprise can start to generate produce without a market. Any project should, amongst other reasons, be selected on the basis of whether the project will maintain market share, increase market share or consolidate market position. Market availability was assessed for the produce of the projects and the majority of both respondent categories (54%) indicated that the market was reasonable, 26% indicated that the market was good, and only 16% indicated that there was no market. Market stability with regards to the produce of the project has to be known and it is always important for farmers to produce commodities that have a good market. Government led market as stated in the National Development Plan (National Planning Commission, 2012) should also be explored, and where possible, a contract be entered into to formalise the market. 57% requirements only slightly met. 62% did not meet market contract requirements. 35% slightly met contract requirements. c) Market price - 70% of both respondent categories indicated that the price received was average and even above average. d) Market transportation - 35% of both respondent categories indicated that transport was hired and 31% indicated that buyers collect produce at the farm gate. e) Marketing of produce - the local community (33%) and the auction (25%) were the most important places for the project participants to market their products. Markets need to be established or identified before approval of funds and farmers must indicate if they will be able to meet market needs in terms of quality, price, quantity and that they will have means to take their produce to the market. This article is part of the author's PhD thesis.